One of the problems with multi series shows, be they anime, live action movie, or TV serial, is that every now and then the creators begin to run out of ideas, regardless of how much promise there was in the first and second series. Shows like Star Wars, Terminator, Prison Break, Heros, Zero no Tsukaima, Dragonball, Suzumiya Haruhi no Yuutsu, School Rumble, and more besides, have all suffered from this lack of creative drive at one time or another. However, the reverse is also true, and there are a number of shows that actually get better as more series are added, Aria and Nodame Cantabile being great examples of this. Another good example is Slayers Try. 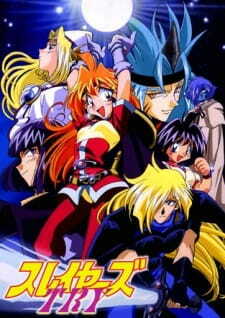 Unlike the previous iterations in the Slayers franchise, Try is not actually based on a novel by Kanzaka Hajime, however the author did write the basic outline for the series. This meant that there was far more room for the creativity of other writers to come to the fore, and it's actually surprising how well Try follows on from the first two series. However, given that many of the production staff are the same as in the previous two outings, and that director Watanabe Takashi is once again at the helm, it should be no surprise that the writers would have a "passing familiarity" with the content. One thing that really stands out about the plot for Slayers Try is the degree to which it progresses throughout the show. While the series manages to retain much of its irrevent humour (albeit in a punchier form), the story is far more focused than in previous outings, and fans of the series may find themselves surprised by the difference. One unfortunate side effect of this "change" though (although I consider it more of an evolution), is that certain viewers, especially those who are diehard fans of the original two series, consider Try to be the inferior addition to the franchise, partly because it's not based on an existing novel, but also because of the increase in plot focus. Whatever the case may be, personally I consider Try to be at least as good as the original series and Next. The plot is well paced and flowing for much of the series, and the increased focus on telling the story only serves to make the humour more precious. The main aspects that fans of the series will find appealing is the fact that in terms of sound and visuals, Try is without any shadow of a doubt, part of the Slayers franchise. Everything from the character design and animation, to the seiyuu and music are, by and large, the same as in previous outings, and this pays off in a big way in many areas of the show. The animators are far more capable and composed than either of the previous two series, while the voice actors are more self assured than before. The fact that even the same production staff have been used on many aspects of Try gives it an extra dimension that neither the original series nor Next had, and this is because at almost every level of production there is a good deal of experience with the Slayers franchise - and it shows. In terms of characters, Try is a more than worthy addition to the franchise. After all, the gang's all here, and this time they have a whole world to play with. Lina and Gourry are just as funny as before, even with the noticeable reduction in jokes involving food and/or eating, Zelgadis is just as moody as ever, and Amelia is still heroically gung ho. Try, however, is unlike either of the previous two series in that the characters are more solid, however this is partly due to the more focused plot. That said, while there is a degree of development for most of the characters, the majority of growth occurs on the part of only one character. Filia ul Copt is, in many respects, a parody of the stereotypical Dungeons & Dragons "Gold Dragon", however she is also the character with the most development in Try. Her background, together with the history of her race, make for a solid platform upon which to develop a character, however this seems to be the biggest area of debate, as many viewers feel that Try should have focused on developing the relationship between Lina and Gourry. Personally, I don't mind her at all, and I can't really understand what all the fuss is about. Filia's personality works well with the other characters, and the fact that she is oft times portrayed as a parody of the D&D Golden Dragon means that she fits in nicely with the ethos of Slayers. In terms of its content, Slayers Try is very different to either of the first two series and, in all honesty, the show seems to have "borrowed" some of the best aspects of both. Being a fan of the franchise, I found that I enjoyed Try just as much as I did either of the first two seasons. However, the more focused plot may be disconcerting to purists, however much of the humour is retained throughout the show, and this is the area where the Slayers franchise normally excels. Granted there will be those who simply don't like Try for one reason or another, and while I can understand the perspective voiced by many nay-sayers, it should be remembered that, like any series, unless there is an effort made to develop the franchise it will simply stagnate. The bigger crime, at least for me, would be to let down the original series and Next by simply re-using the same formula over and over again - such things become tiresome after a while. Granted there is a degree of that in the third series, however Try is also very different to its predecessors because of its tighter story and focused plot. Try is most definitely a great addition to the Slayers franchise, and while there are those who don't like the series, there are just as many who do. If you're a fan of Slayers but haven't seen Try, then you should definitely mark it as one to watch. The show has all of the appeal of the first two series, yet is unique enough in its own right as well. That said, newcomers to the franchise are advised to watch the first two series before watching Try, as there are numerous references to previous events and characters. On the whole, Slayers Try is one of those shows that you should really make your own judgement on. While there is a certain "business as usual" feel to the series, there are plenty of new characters, places and occurences for Lina and the gang to mess with/blow up/steal from, and it's great to see them given a much bigger "playground" this time around. If you haven't watches the other Slayers Seasons this one is not the one to start at, but it is in my opinion the best of the series. Finally you get to see other great monsters and gods and the power of destruction they have. The story was the best story of all the seasons, it had gods, monsters and the humans who exist in between them. The whole humanity part and the constant battle between gods and monsters struggle really hits home with a lot of key ideas present in the world. Best plot line from a Slayers season yet. Of course and Slayers wouldn't be slayers without those really strange and wacky episodes and characters which I'm glad to say there are a decent amount but not too much craziness to diverge too far from the plot. Nice little comedic breaks. All the characters have their outstanding personalities and we even dive deeper into a few of the main characters. I love this anime series, mainly because it was the first one I saw, but this season blew me away. I've re-watched it 4 times and still enjoy it. If you decide to watch TRY and expect the same humour value as Next, you'll only be slightly disappointed. Many people dislike Try for that reason, they are expecting something different. Each season of slayers seems to build more on the storyline (ignoring Revolution and Evolution-R), and Try does a great job of that. It focuses on a lot of different perspectives, and the question of how to define the good guys vs. the bad guys. The series explores the relationships between Mazoku, gods, those that are neither, and those that are both. Xellos shows his dark side, which makes me love him that much more. And the relationship between Xellos and Filia is hilarious. The comedy in Try is different that the previous two seasons. There are fewer filler episodes, a lot of suspense, and a lot of action. There are 6 episodes in the season that I found sort of weak (15-20), but the other 20 episodes are by far the best in the series. The series brings out a lot of emotion, and is in my opinion the best of them all. In the world of entertainment in this case anime, it's usually a crime punishable by ridicule to not fall into the hive mind. One may find themselves victim of the hairy eyebrow simply for seeing something from a totally different perspective. In regards to the Slayers series, at least before Slayers Revolution and Slayers Evolution R; it was pretty much mandatory to at least think of Slayers Try as the inferior series of the franchise. Many of the complaints I heard about the series is the unfamiliar feel to its predecessors: "the comedy and silliness simply isn't the same", it's different", and other criticisms of that type. This brings me to believe that many people have a big soft spot for redundancy, and evolution can simply take a walk. Slayers needed to stray away from its usual path because its weaknesses really began to show in Slayers Next. Slayers Try has a familiar feel, but there is clearly something different here and it really isn't a bad thing. After this re-watch I firmly believe Slayers Try is the best of the first three seasons. This story takes place awhile after the battle against Fibrizo the Hellmaster. As a result, a barrier surrounding the island which was put in place by the monsters has been lifted giving access to the outer world. Lina and Gourry encounter Zelgadis, and they're soon greeted by a woman named Filia whom later briefs them about a prophesy that will lead to the world's destruction. The crew gather and go off on this new adventure. It's very important to mention that Slayers try doesn't feel as madcap as the previous seasons. There definitely is plenty of random comedy to be found, but there's more of a focus on plot progression, story development, and even character development for a new character. Surprisingly, Slayers Try is actually at its absolute weakest when it breaks away from the main story and focuses on the stupidity. Even the characters some times break the fourth wall mentioning the stupidity in a negative way, which can add to the fun. When Slayers Try is focused, it definitely delivers an engrossing experience with plenty of very interesting back story, and the plot is frequently effected by all of this. The large amounts of story works very well in developing the character Filia and her people, as well as new threat Valgaav. I have to say that Valgaav is by far the most interesting villain in the series at this point, and is far away from the usual cookie cutter type meant only to push the plot. Filia was indeed a surprise and many fans were ticked because she received so much development while Lina and Gourry's budding relationship received no attention. I'm fine with this completely because Filia actually served a purpose, and there was more to her personality. Despite some small missteps in pacing, when compared to the last seasons I was surprised by the steady progression a majority of the time. I also liked the smaller details on how the outside world saw people using magic, with some of the populace seeing Amelia as an angel from heaven as she cured a person from an injury. It would have made for better storytelling had this story element been given more time. I hope some people don't get things twisted though; there is still some good comedy like one of the early food fights between the crew involving some spaghetti, Lina's angry insults, along with Gourry's classic stupidity, and some in your face parodies that actually work. Also, the action is pretty stable too with some nice encounters against the main threats. The animation is about on the level of Slayers Next which isn't a bad thing. The high energy attack battles are still just as vibrant, epic, and entertaining, and there's quite a bit of onscreen death. Valgaav has a nice design along with various others clearly indicating that some of these guys are from a different world. The darker settings still look just as great, and the soundtrack still does its job good enough. In regards to voice acting, the English dub continues to shine and Lisa Ortiz simply has Lina Inverse down. It may be blasphemy to hail Slayers Try as the best of the original series, but swimming against the current has been my style for years; to those whom came into the first two series I highly advise to brace yourself for something kind of different. This series has plenty to offer while still maintaining something from its usual self.